You might be wondering how finding things to buy at Dollar Tree can save the day. Just what does that mean anyway, ‘save the day’? Well let me ask you this- have you ever run out of toilet paper? Then you know exactly what I mean! Shopping at Dollar Tree is usually what we do between our bigger monthly shopping trips. I’m lucky I have a Dollar Tree Store near me. I’m usually pretty good about gauging what we need and keeping our supplies on hand. But it never fails that we run out of things before the next month comes. Often times it’s due to having to purchase unforeseen items or sometimes we just go through things faster. Either way, when you’re out of toilet paper, something must be done, am I right? Now I don’t know about you, but I can’t always go back into the big box stores three quarters of the way through the month. For one, I always end up spending way more than I plan to. And second, I’m not doing an entire month’s worth of stocking up, I just need enough to get by for the week until payday comes again. Anyone feeling me? This is where Dollar Tree shopping comes in. I might not be able to set out and spend another $50-$100 dollars, but hey, if I can scrape up $10 bucks, I’m good to go! Toilet Paper– I only do this in a pinch and it rarely happens as I’m usually stocked up on toilet paper. It’s usually not the best quality but it will get the job done! Paper Towels– I can get the same brand I usually buy. Napkins– Not top of the line but they work. Kleenex– same brand as I usually get at about the same price. Sometimes I do stock up so I don’t have to buy them at the first of the month. Paper Plates– cheap, but they work. Just don’t try to eat spaghetti on them, know what I’m saying? Dish Soap– I used to get dish soap here between my bigger shopping trips, but I never run out now because it’s delivered to my door every month. Laundry Soap– I admit, I have never bought laundry soap from Dollar Tree but I know they do carry it. Toothpaste– They carry brands like Crest, Colgate, and Aim. And it’s the cheapest place to buy toothbrushes! Deodorant– Limited brands but they do carry men’s, women’s and teens. Shampoo– Again, not something that I usually purchase but they do have brands that would work if you were totally out of your regular brand. Hand Soap– Dollar Tree carries many of the same brands at a lower price. Bath Soap– Many of the same bars that you can find at the big box stores, usually sold individually or in 2 packs. Lotion– Mostly off brands but I have seen a couple name brands here. Shaving Cream– They have the same cheaper brand I usually get at Walmart so it works in a pinch. Hair Detangler– I usually buy this anyway when we need it as it’s almost two dollars cheaper than at the big box stores. Some people don’t like shopping at Dollar Tree, and that’s fine. You might have a another store that you like or certain brands that you’re loyal to. Maybe you think everything there is low quality. But that’s just not true, there are many things that are just fine to purchase from Dollar Tree. And let me ask you this: Would you rather pay more money for the same items? I can get Sparkle Paper Towels, Soft Soap Handsoap, and Palmolive Dishwashing Soap all for cheaper than they sell in the big box stores. So while you might want to pick and choose what you get, there are many items that are equivalent, if not exactly the same as you get elsewhere. So here are a few of my absolute favorite things to get at Dollar Tree. I like shopping there because number one, I can change things up a bit in my house when I want to. Number two…everything’s only $1 each! I LOVE the selection of these items at Dollar Tree! I literally can pick up an entire set for my kitchen- dishtowel, dishcloth, and two potholders for less than $5 bucks! Can’t beat that! And they’re cute, I usually choose the coffee inspired ones. They always have colors that match my kitchen. About every few months I replace our placemats as well. Everyone gets a new one, and it only runs me $6. Seriously, if you need a potato peeler, salad tongs, basting brush, spatulas or cooking spoons, you won’t find them cheaper anywhere. 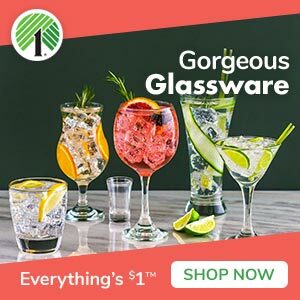 Shop From the Dollar Tree Online Catalog today! Ah, one of my favorite things to buy period. You might say I have a bit of a problem collection. I always find cute ones at Dollar Tree, one of my favs is below. Good quality, great price. I have a set of Coca Cola glasses and was able to get a set of mini cups that are the perfect size for a small cup of juice or milk for the kids. I also recently purchased a set of 4 small blue glasses that look really beachy and I just love them. Now if I only had the beach house to match! If you’re just looking for basic plates, they have a wide variety of colors of Gibson glass plates. They are perfect for breakfasts and lunches, and are microwave and dishwasher safe. Occasionally they carry heavier dinner plates in a variety of styles, also Gibson brand. I have a set of 6 that I’ve had for years and they are very heavy and nice quality. I don’t know about you but to me, party supplies are the biggest waste of money ever. So I can never bring myself to spend much on party supplies. Dollar Tree is the perfect place to get supplies, you can pretty much furnish an entire party for twenty bucks. There is always a plentiful supply of these, especially right before the first of the year when everyone is buying calendars and planners and trying to get organized. 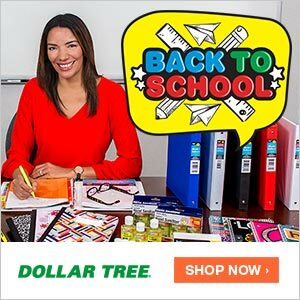 I save a ton every year by shopping Dollar Tree first for school supplies. I know the schools are usually picky with things like pencils and glue, but I can get composition books, erasers, notebook paper, folders and more for only a buck. My middle daughter loves to craft. So when we visit Dollar Tree she always swings by the craft section to see if there’s anything she needs. She has bought everything from craft glue and glitter to Popsicle sticks and more. If you need artificial flowers, the Dollar Tree floral department has some good options. Although I’m very particular about the kind of makeup I use, I have bought name brand lipstick, lip gloss and some makeup from Dollar Tree. Also things like cosmetic brushes, nail polish, and eyelash curlers are good buys. They also carry other beauty supplies like hair brushes, mirrors, hair ties, and more! Well there you have it, that’s how finding things to buy at Dollar Tree can save the day at your house like it does at mine! I hope this has given you some good ideas about the type of things you can get and how you can save money. Do you shop at Dollar Tree? Why or why not? Share with us in the comments, I’d love to hear what you think! I can be dangerous at Dollar Tree! That is the only place I buy party supplies, gift wrap and gift bags. Why spend $4 or more on a gift bag when you can get one for $1? Another thing to check out is greeting cards and mailing supplies. Dollar Tree is my first stop for those things.